Shortly after entering MetLife stadium for the twelfth Siyum HaShas (the completion of the six orders of the Talmud) last month, I encountered John. 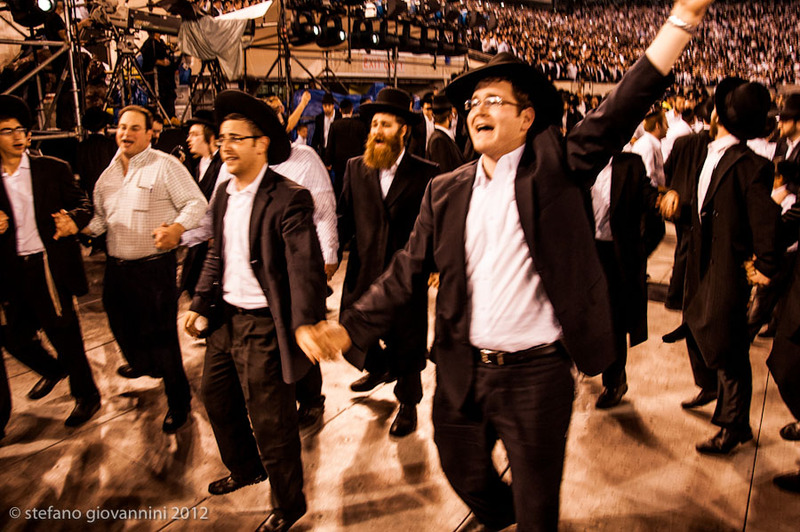 An affable, salt-and-pepper-haired event staffer stationed on the field, he recalled working the 2005 Siyum HaShas and was looking forward to the evening. Though he may not have understood many of the messages spoken from the podium, John well summed up the most essential achievement of the event itself. scope or significance in modern Jewish life. However, more noteworthy than any of what transpired on the stage was the very nature of the audience in the stands – something not lost on the event’s architects. “Take a look around,” thundered a proud Elly Kleinman, the event’s chairman, from the podium early on in the evening. “There’s a cross-section of klal yisrael (the Jewish nation) represented here tonight: sefardim, ashkenazim, modern orthodox, chassidish, yeshivish, and the thousands of ba’alei teshuva that are present. Borders of geography, background of observance, and age melted away as myriads stood, sat, cheered, sang and danced to celebrate renewed commitment to one of the sacred treasures on which they seek to base their lives, the Talmud Bavli. The crowd included many dedicated to teaching it, veterans and newcomers alike. For Rabbi Moshe Elefant, Chief Operating Officer of the Orthodox Union’s kashruth department, this Siyum HaShas was the sixth he was attending, the third cycle in which he completed teaching the daf – now heard by 1,800 learners in what is perhaps the world’s most accessed Daf Yomi shiur, at oudaf.org. Across the stadium sat Rabbi Daniel Fridman, the dynamic resident scholar of Manhattan’s Jewish Center. This was the first time he attended and participated in the Siyum HaShas, joined by seven congregants completing the Daf Yomi cycle with him. “The best part was the camaraderie,” Rabbi Fridman said of teaching the shiur (Torah class). 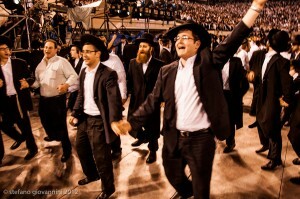 Camaraderie was, in fact, the dominant emotion marking the evening as well – the night’s crescendo was not in the programming, but the interlude following the kaddish (Jewish prayer sanctifying G-d) after the recitation of the siyum, in which the approximately 90,000 reported present erupted into collective jubilation. The eminent Rabbi Marvin Hier of Los Angeles’s Simon Wiesenthal Center characterized the event as “the greatest Kiddush Hashem (sanctification of G-d’s name)” possible. As he left the stadium, Rabbi Hier asserted that such a large gathering organized by Orthodox Jews was unprecedented, not only in recent history but in all of European Jewish history as well. “It shows the strength of Orthodoxy, and we should use it to build more strength,” he said. Rabbi Hier also highlighted the announcement made that among the crowd were an estimated 5,000 ba’alei teshuva and non-observant Jews. Indeed, Agudath Israel’s outstanding achievement, perhaps surpassing the extraordinary celebration of the Daf Yomi cycle completion, was in convening the magnificently diverse tableau of its participants. The most lasting memory many departed with was likely not of anything said or distributed but of the rapture of rejoicing together with tens of thousands of fellow Jews of all kinds. Such sentiments rippled across the stadium and in scores of other live-feed centers at which thousands more were participating around the world. Much of the reporting since Siyum HaShas has focused on the turnout and the extraordinary logistical coordination the event required. But the siyum’s greatest accomplishment of reaching out and its attendant lesson has been somewhat overlooked. The passion felt in the dancing circles on the field and in the stands among so wide a range of Jews is something that can and should be circulated more often than every seven-and-a-half years. And it does not always have to be in a sports stadium or even in the public eye altogether. Jewish organizations can and should continue to build a sense of arvut, of fellowship and responsibility, among individual communities and clusters of individuals. Such efforts should be constantly refocused and refined to extend to those not yet touched by the power of living Jewishly. The most vibrant shuls in North America today are centers of not only davening (prayer), but hubs of Jewish life and education – places that congregants and newcomers alike have a reason to frequent, where there is formed a curiosity to come back. Such models need to be better highlighted and emulated elsewhere. Collaboration among community shuls is also something that needs to happen more frequently, even if just for social purposes. The outreach renaissance continuing to flourish especially on college campuses and in public schools needs more of our attention and support. Spreading its messages should not be limited to those expressly paid for kiruv (outreach) efforts, either. Rabbis and lay leaders at all levels of Jewish communal life should also look to grow from the outside in. But reaching the masses indiscriminately in meaningful ways requires that leaders think big while also paying close attention to details – spending resources wisely, treating patrons and partners with dignity, creating savvy marketing, and, above all, enlisting sincere and competent employees willing to work hard. One gathers that only through such efforts over the last two years of planning did the Agudah achieve such success. It behooves their leadership and that of other Jewish groups to notice what John noticed and look to replicate it more often. Participate in the largest daf yomi shiur in the world at oudaf.org. Hear a behind-the-scenes interview with maggid shiur Rabbi Moshe Elefant here. Binyamin Ehrenkranz is on the editorial committee of Jewish Action Magazine. He can be reached at be25@outlook.com or on Twitter @behrenk.